In 2009 Rebecca Schacker purchased a foreclosed home in the Foster-Powell neighborhood and embarked on a down-to-the-studs renovation, with the goal of creating a homey, welcoming clinic space. 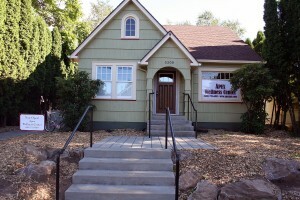 The finished building includes five treatment rooms, an ADA accessible bathroom and entryway, off-street bike parking and a yard landscaped with carefully chosen native plants. Apex opened its doors to its first patients in September 2010. Rebecca envisioned a neighborhood-focused wellness clinic because she believes that people gain much more from their treatment when they can access it in their own community, just a short walk or bike ride away. She calls Foster-Powell her home, too. Apex provides Chiropractic & Physical Rehabilitation, Massage Therapy, Acupuncture & Chinese Medicine, and Family Medicine because the combination of these practices offer patients holistic, integrated treatments that do not rely on drugs to stifle pain. Instead, these practices treat the roots of pain, in the bones, muscles, ligaments and tendons. Apex also provides nutrition and lifestyle recommendations, because our health and wellbeing is deeply effected by how we treat our bodies and what we put into them.